When I first heard Rainbow Beast’s debut children’s album, Tales from the Monstrosity Scrolls, I instantly connected with their sound and the stories within the songs. The content was dark, mysterious, imaginative, fantastical, absurd and profound. It lit up our living room! I immediately read their bio which led me to Rock Band Land, a San Francisco-based creativity program for Elementary school-aged children. Brian Gorman, drummer for Rainbow Beast, founded Rock Band Land almost a decade ago and, with the help of co-director Marcus Stoesz, shaped it into an awesome program that ignites the imaginations of these kids. Rock Band Land offers so many benefits including teamwork, self-confidence, responsibility and how hard work really does pay off! To date, Rock Band Land has produced over 150 songs, 18 of which can be found on Tales from the Monstrosity Scrolls. In the interview below, Gorman talks about how punk music inspired the creation of Rock Band Land, how an epic battle at the center of the earth inspired the name Rainbow Beast and the rules of Rock Band Land. Kids Can Groove: Hi Brian! Can you tell me about Rock Band Land and your band Rainbow Beast? Brian Gorman: Rock Band Land is a creativity program in San Francisco for Elementary school-aged kids. Rainbow Beast is the band that was born from Rock Band Land and it consists of my Rock Band Land teaching partner Marcus Stoesz, and our bassist, Jen Aldrich. Together, we write and produce all original stories and songs with the kids. The songs begin as stories and we collect the ideas for the stories from the kids. Then we move on to collecting musical ideas for the song, assembling those ideas into a full song that the kids learn, record and perform on stage in what we call The Big Show. KCG: How was Rock Band Land created? BG: I was a preschool teacher for 2 years in San Francisco, and then a few years before that I taught English in Japan for Pre-K through twelfth grade. While I was teaching, I was also a touring musician and when I would come back to the schools, I started bringing in really good rock music to share with the kids. I thought I could write a punk song with some 4-year-olds. I started on a lark and, after a month with them, we finally wrote a song. It was really fun and it worked! Once I saw that that was possible, I slowly began to build it up. I tried one Saturday morning class with 4 kids to see if it would work outside of school and it did. After about a year of experimenting with it, Marcus moved to San Francisco. Marcus and I met through our touring bands when we were on the road. Marcus is a phenomenal musician and he just happened to move to here at the perfect time, so I scooped him up and since then it’s just been full steam ahead. KCG: Why did you decide to work with Elementary school-aged kids? BG: That’s where magic is still real. When you are creating something, if you’re able to embrace the magic in it, you end up making better art. These kids have incredible imaginations and they’re not afraid to go into magical places, which makes the creative process so much more exhilarating for everyone. There’s very little resistance to going on an adventure and exploring our imaginations together. KCG: In a mixed age class, do you find that there is equal participation between the youngest and oldest rockers? Are they supportive of each other? BG: Absolutely! Honestly, the best classes we have are the ones that are mixed ages. The ideas are broader and more fleshed out when we’re talking about the stories. The older kids do a really good job of helping out the younger kids, and the younger kids look up to the older kids. We had a band with the greatest age disparity that we’ve had in any of our regular bands. A girl had just turned 9, and two other kids in the band had just turned 4, so there was a 5 year difference, and they worked unbelievably well together. KCG: I can see how the different levels of maturity influence the content on Tales from the Monstrosity Scrolls. On first listen, it doesn’t strike me as a traditional children’s album. But, upon closer listening, I can hear how the lyrics fantastically reflect the kids’ ideas. It’s outstanding! The stories accurately express the things they are curious about and fascinated by. For example, “Ice Girl” is a story of a girl who emerges from a frozen lake as a superhero and uses her powers to save people from drowning in hot lava. What is your process for writing these stories and songs with the kids? BG: We have very specific guidelines for when we are writing the songs. It’s all run by the kids, but our rules really help shape where we go, and provide boundaries for us. 1. The story has to be original. We don’t talk about Star War or Ninjago or whatever the thing is that they’re fond of at the moment. It’s all our own characters, our own storyline. Sometimes they’ll be scenes that you could say relate back to these things, but in the end the characters are our characters and the situations that they get into are all ours created with the kids. 2. Anything can happen but there has to be some redemption in it. Characters can die, there can be plagues, there can be floods, there can be fighting that happens but there has to be some redeeming factor to the story and that really guides us. When some stories are getting really dark, we ask the kids how we can find a positive outcome. Most of the rockers who have been with us for a long time really understand when we’ve crossed a particular line and that we either have to cut out or be turned around in a way that justifies where we’re going with the story. 3. No potty words or bad words. Basically, as soon as you allow the kids to start singing about poop that’s really all we’re gonna talk about. 4. This is an important one. The rockers can dislike anything they want. They don’t have to agree with where a story is going. But, If they disagree with the direction the story is going in, it’s their responsibility to change it and make it work for them. We work really hard to help the rockers understand that they are in control of their imaginations and that they are in control of their creativity. We set up a dynamic where there’s no judgment if a rocker wants to change something, especially if it’s around something that frightens them. For example, if a shark character comes up and a kid expresses a fear of sharks and asks that we don’t incude them in the story, we will work together to turn that character into a whale or something else that everyone can agree on. We continue working through this until we can agree as a group. Our process is basically like the first rules of improv. It’s always “Yes, and…” If you say “No” you block the process and it shuts the whole thing down. So the rule is that they have to keep going with the story and if they don’t like it they have to help us reshape it to a way that they like. It ends up working really well and reinforces the importance of being on a team. KCG: Next to each song on Tales from the Monstrosity Scrolls is a band name. Can you explain how those names are created? BG: Generally the first week of class is when we name a band, and we go through all the same rules I previously mentioned to come up with the final name. We use this initial process as an exercise to get the kids warmed up, working together and understanding that they can say silly things, and take chances. It’s actually encouraged because the sillier they get, the more creative they get, the more excited we get and the more positive feedback they get in return. We usually go through about 50 different name suggestions before we come on to the one that we then vote on and choose. In those 50 names there’s usually some really crazy collection of words. KCG: Can you explain how the name Rainbow Beast came about? BG: There’s a mythology about Rainbow Beast that’s ever growing that we talk about in RockBand Land. The kids know there’s me and Marcus, and then there’s Rainbow Beast. Rainbow Beast is sort of like a hyper-realized version of each of our own personalities. When we play, we dress up and have makeup on that represents characters of ourselves. I’m a very high energy, very loud, vert spontaneous person. Marcus is very sensitive, very gentle, and very quiet, and Jen is kind of stoic and sharp and witty and dark. So we play these parts of our personalitithes that we like about ourselves, and that make us who we are, but are also fun and easy to embellish on in a theatrical performance sort of way. The name Rainbow Beast comes from a song called “Ninja Noodle” that we wrote 4 years ago. It was one of the first songs we wrote. Ninja Noodle is a noodle that is not happy with his regular life. He doesn’t just want to be a regular bit of macaroni and cheese. He wants to be more, so he trains, and he studies, and ultimately becomes a ninja. Naturally, every ninja needs an arch enemy. Trishta, part shark, part T-Rex, part tarantula meets Ninja Noodle and they have a pretty epic paintball battle at the center of the earth. They fight by firing paintballs at each other which hit and cover the walls of the center of the earth. The paint splatter ends up making this beautiful rainbow. Trishta and Ninja Noodle both pause at the same moment when they realize that while they were both fighting, the result of their fight created an amazing mural. They are so taken that they both fall in love and get married. So the “rainbow beast” is what they made on the wall and that’s how we see what the kids ideas are with us. They’re shooting us with their ideas, basically, and that’s how we collectively grow and thrive. They made us and now we’re here to care for their ideas, basically. KCG: How did you come up with the concept for the cover? The concept I originally had for [the cover] was that we were piñatas and the kids were beating us with sticks and color was flying out of us. After we talked it through a bunch, we realized that we didn’t want to promote anything that would be seen as violent or aggressive. We reshaped it into something that still went with a similar concept but is more playful. For the design of the album cover, we enlisted some extraordinarily talented parents in our community. Two of our early parents, who became huge supporters of us, are Stacy Ransom and Jason Mitchell of Ransom&Mitchell. They are amazing fine art photographers and their son, a phenomenal rocker who’s been with us for years, appears on about 4 songs on [Tales from the Monstrosity Scrolls]. KCG: How did you choose the songs on The Monstrosity Scrolls? BG: Everything on the album was written in Rock Band Land. We were trying to figure out how we could include as many kids as possible on the record. 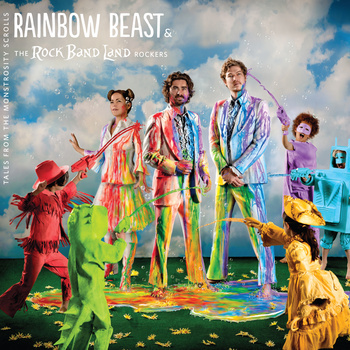 There’s about 200+ kids on that record, and we wanted to make it clear to listeners that Marcus, Jen and I are playing the music, but this project is all about working with the kids so that’s why it’s Rainbow Beast and the Rock Band Land Rockers. And that’s why after each song we gave a nod to each band so that they are recognized for their work. They helped make it so they need to be represented. It is all them. KCG: What percentage of the music on Tales is being played by the kids? BG: All of the music comes from Rainbow Beast, though there are a couple of kids who are playing guitar on the record, and all the kids are singing on every song along with us. A lot of the kids come to us with zero musical experience and that’s totally fine. No musical experience is required in order to come work with us. Their ideas, however, are all over the record. KCG: Can you share any interesting experiences you had while producing these songs? BG: The beat in “The Ballad of Annabelle and Sam” was created by a 5-year-old playing body percussion. He came into class and said, “I know a beat,” and started doing this insanely cool rhythm. He kept the beat on his body, smacking his legs, his thighs and his chest, and clapping. He was also doing using his feet and it was so solid. 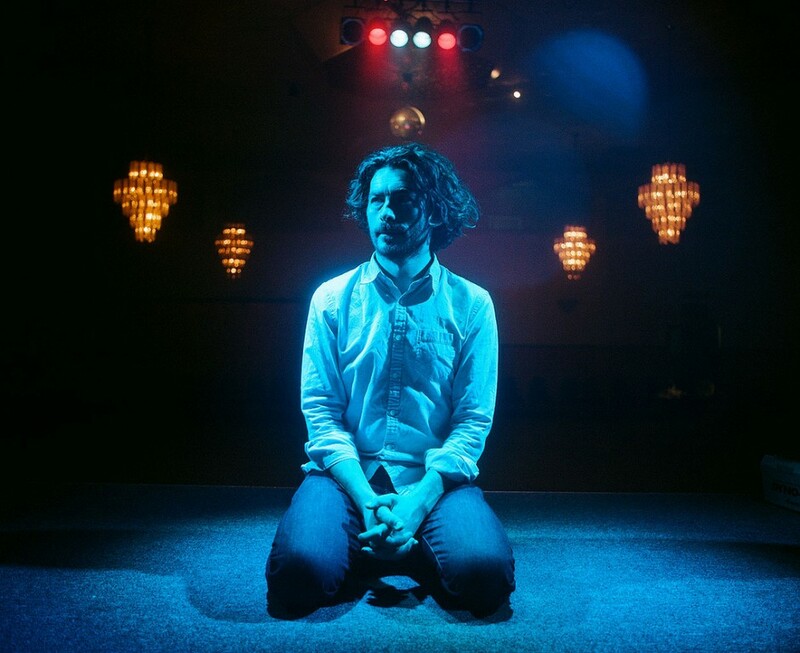 We set him up on a bass drum and put mics all around him – his chest, his legs and his hands. We recorded his beat, looped it and put my drums on top of his rhythms. His rhythm became the foundation for the song and, as strong as the song is, his beat is what I love most about it. Everything you hear in that song was done at Children’s Day School in San Francisco in a classroom. He is now one of my star drummers. KCG: So, why did you release an official album? BG: There are several reasons, really. To start, it’s to celebrate all the stuff that we’ve been doing and to celebrate the community that we’ve created. We had a big show to go along with the release which gave Marcus and I a chance to celebrate with the kids and their parents in honor of what we’ve worked on for the last couple of years. We are a hard-working band, and I believe that people will be really excited about the album when they realize the evolution of it all and hear the crazy stories that go with it. We have all the stories accessible online for people for free and all the different components that we’ve been working on that are finally starting to come together. Our release allows us to hopefully announce and expand our community beyond the boundaries of what we have for a school. Rock Band Land classes stay small for very intentional reasons. We can’t have any more than 90 kids, and it’s just Marcus and I teaching and running music production. Our kids get so much out of it. In addition to the creative aspects, there are literacy components. Once we write the song, [The kids] all have lyric sheets and get one week to memorize the songs. Many of our kids use their songs as their reading work at home, and we use a lot of challenging vocabulary. We’ve seen countless examples with our kids where their reading and writing has skyrocketed because of this and they’re are extremely confident and proud of themselves. We see all these things that could work for so many other kids that doesn’t necessarily have to be in our program. Releasing [Tales from the Monstrosity Scrolls] is our initial step towards becoming a bigger entity and bringing all the fun and lessons from Rock Band Land out to the broader community. KCG: The Monstrosity Scrolls is definitely going in a completely new and cool direction and stretches the limits of what we think of as children’s music. BG: As far as I’m concerned, there is absolutely no harm in sharing most any music with kids, especially if you share different kinds of music with and talk about what they are hearing in the song. I think you have to be careful with some of the content and some of the language. But, even songs that are very dark or aggressive, if you take the time to actually talk about what the words mean, or maybe ask the kids what they think the songs are about, you can breakdown most anything and find something redeeming in it. Rock music, from the second it came onto the scene and people became aware of it, they were afraid of it. It was considered to be “the devil’s music.” When the Beatles came out, they were terrifying but wen you look at rock music now, there’s not a kid on the planet that doesn’t know the Beatles. The Beatles were considered to be inappropriate for kids when they came out, and now the first music most people give their kids is any Beatles’ record. Anything people are afraid of now, I feel that maybe there is a misunderstanding and wonder what is sparking that sensation in people, but I don’t think it necessarily makes it inherently bad or dangerous or necessarily inappropriate. KCG: The first half the album seems to have a different feel than the second half. Is there a difference and, if so, was that done intentionally? Had you thought about dividing it up into two albums? BG: It was gonna be 4. We were going to have 2 records; 2 audio and 2 radio drama records. It was gonna be this huge boxed set and our concern was that the record would go out and people wouldn’t realize that the songs actually come from stories and that we produce the stories with the same care and quality that we produce the songs. Then we started doing podcasts this summer and realized that the podcast is an easier way to connect people with the story content. So instead of producing something huge, like 4 hours of media for the kids, we just went with a full album of songs. Marcus spent countless hours just going through trying to create the arc of the record that you are speaking about so that it had this different feel, and that it changed and shifted. So if you are paying attention there is an arc to it that’s hopefully enjoyable and gratifying. He put an incredible amount of time into thinking about that. KCG: How do you describe Rock Band Land to parents of future Rock Band Land rockers? BG: The first thing is that I give them tons of information beforehand where I tell them straight out that we are not afraid of the dark in Rock Band Land. We are going go to dark places and that’s because when we circle up with the kids and talk about what we want to write about, it’s all collaborative, it’s all led by their ideas, and we ask them straight out “What type of song would you like to write?” “What type of story would you like to write?” Inevitably, the first two requests, almost every time, are spooky or scary. The reason for that is because kids tend to feel a certain joy and thrill about exploring what scares them. But, there’s also some important developmental stuff going on where the kids are working through ideas. Kids are very aware of what they hear and their surroundings. They take all that stimulation in and begin to realize how they can relate in their own world. They think about what could actually hurt them, and begin to understand where they are safe and where they aren’t. Rock Band Land is a way for us to support these kids in a comforting environment. The cool thing, though, that we offer that might be different in some ways is that when we send the songs home with the kids they have a week to learn it and it’s up to the family to learn it. We always send along the chords so if anyone plays piano or guitar at home, they can play along, and a lot of families use it as something they do before bed or on the way to school. [The kids] have to listen to it at least 3 times a day to be ready to record. We get a countless number of emails from parents who are psyched that they’re learning the song with their kids. It’s a bonding experience for everyone. « National Fire Prevention Week: Watch videos by Recess Monkey and SteveSongs plus FREE app downloads!